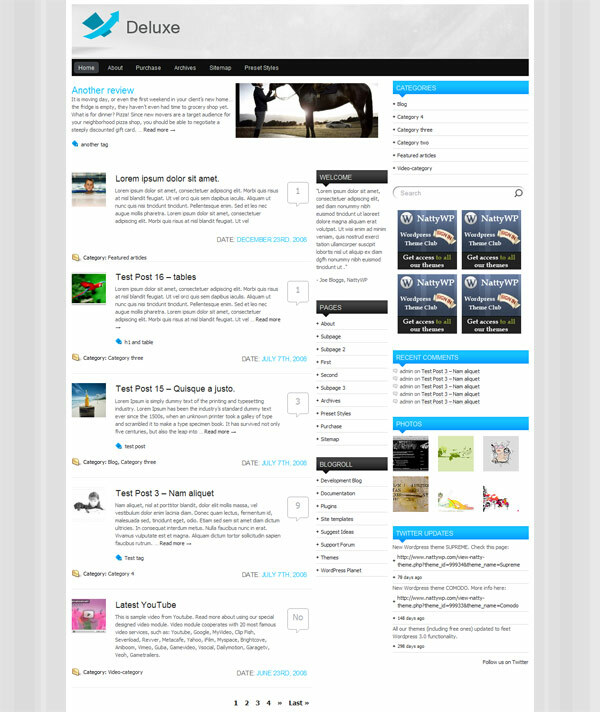 Deluxe is a universal theme for blogs. Thanks to the built-in panel this theme can be easily adjusted to any site, be it a corporate blog or a news/magazine style website. The theme is supplied with 8 additional widgets, a module for color adjustment, and is extremely user-friendly. What else do you need from a good theme? Well, there are a few more things, but you get them as well… Like control for the visibility of a small sidebar. Thanks to the settings you can switch from the 3 columns to the 2 columns template. You can choose whether the full post should be displayed, or it would be a short outlay. The Deluxe theme also boasts a video widget displaying the latest uploaded videos. It is SEO Optimised Layout with custom SEO settings, you can add video to your post from more than twenty video services such as Youtube, Vimeo, etc. and more.